For many years now, I have been walking down Fieldgate St regularly to enjoy the spicy lamb chops which are my favourite dish at Tayyabs in Whitechapel. My heart always leaps with delight to see the waiter carrying the sizzling iron dish upon a wooden tray, weaving his way through the crowded restaurant towards my table, laden with a satisfying pile of these spectacularly delicious chops that leave my mouth singing with a thousand spicy flavours for the rest of the night. 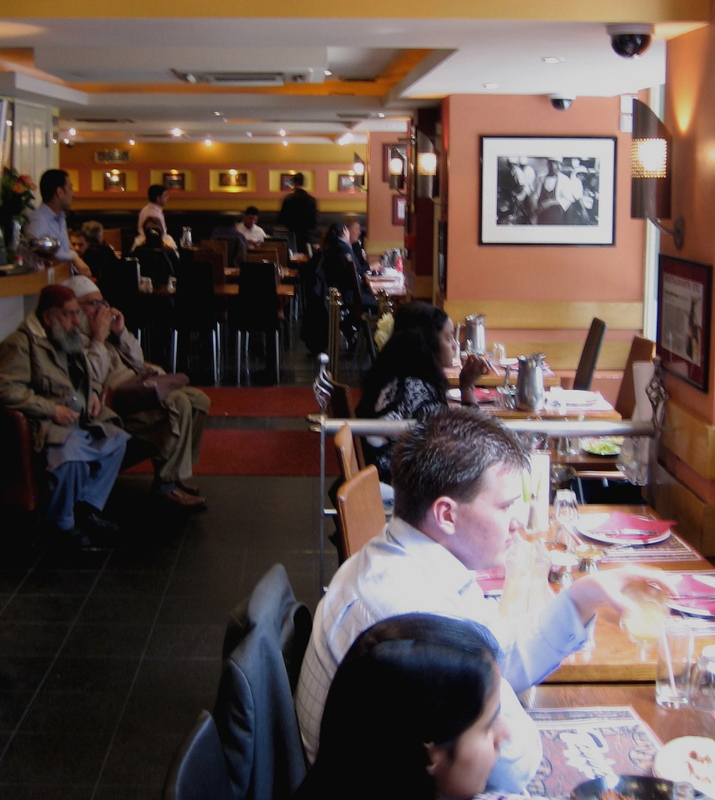 As time has passed Tayyabs has grown and grown as fast as its reputation has risen, acquiring more and more premises, stretching down Fieldgate St, while the lines have lengthened too, but the lamb chops have remained consistently brilliant. This week, it was my pleasure to walk down Fieldgate St and, after all this time and so many lamb chops, finally shake the hand of the unsung genius behind the celebrated Punjabi restaurant that is pre-eminent in the East End – Mohammed Tayyab himself, who founded the restaurant more than thirty years ago. I love the drama of Tayyabs. First you join the garrulous line of hungry customers waiting for tables, then you cast your eyes upon the diners preoccupied by the intense culinary experience that this food delivers, becoming even more ravenous at the sight of others eating. Then, once you have been assigned a table, you walk through all the separate properties that have been joined up to create the restaurant, until you reach the former Queen’s Head public house, where you turn right. Here you get a glimpse of the kitchen in the far distance, through a helter-skelter of waiters running to deliver the dishes, especially the sizzling lamb chops, as fast as they can. If you want to go somewhere and feel at the centre of life, this is a wonderful place to come. The cacophony of sound and the variety of spices drifting in the air add up to an intoxicating disorientation of the senses. Yet, even if it may seem like chaos at first glance, there is an exquisite harmony to it all. Mohammed Tayyab’s three sons run the business today, Aleem manages operations jointly with his brother Saleem, while eldest son Wasim is the head chef. Aleem welcomed me and ushered me into the private dining room for a brief audience with the great man himself. Mohammed cuts a delicate figure these days, a man of slight structure with benign lively eyes and fine nimble hands. In fact, I recognised him from my previous visits, but such is the modest presence and retiring nature of this remarkable man, I should never have guessed that he was the proprietor. Yet the combination of his undemonstrative demeanour and sharp eyes permit him to notice every detail of what is going on and, although his presence is quiet, there is a shrewd intelligence to the man. I have no doubt he has opinions. Placid and fulfilled now, Mohammed Tayyab let his son Aleem talk on his behalf, nodding and smiling at the salient points in the telling of his story, familiar through affectionate retelling within the family circle. In my portrait of Mohammed, you can see, over his shoulder, an image of his diffident younger self, when he set out bravely as a young man to come to London in 1964, leaving his wife and three daughters behind in Pakistan. Since he would be alone in a foreign land and fending for himself, his mother taught him how to cook before he left. He learnt to prepare the traditional Punjabi food that sustained his family, so that he could feed himself while working in the garment trade in London. No-one could have realised then, that these modest cookery lessons would become the basis of the family’s fortune and the future menu of one of London’s most celebrated restaurants. When he arrived in 1964, Mohammed lived just across the road in Fieldgate Mansions in a tiny flat that he shared with other Pakistani garment workers, who all worked long hours together in the sweatshop at Victor & Mark’s factory, quilting and stitching, at the top end of Fieldgate St. Everyone took turns to cook, but I am told that they all looked forward to Sundays when Mohammed cooked the dishes his mother had taught him in Pakistan. In those days, there was a newsagent and a cafe upon the location of the current restaurant where Mohammed bought his newspaper and a cup of tea each day. One day, when the cafe closed down, Mohammed decided to take it over, but such was the modest nature of his beginning, that he only had two loaves of bread and tea when he opened. 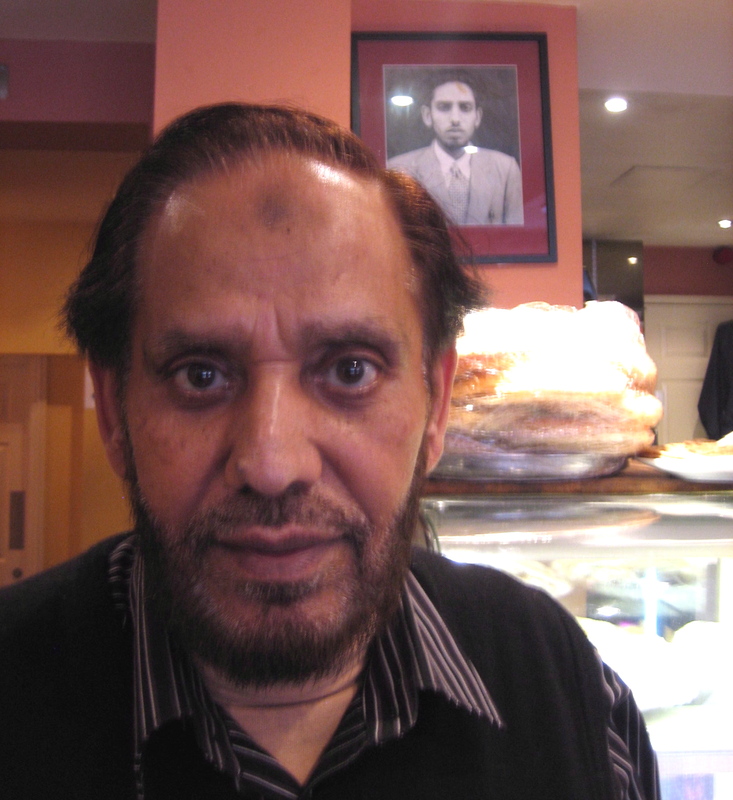 Tea and toast was the extent of the menu in Mohammed Tayyab’s first culinary enterprise. It could not have been plainer. Before long, he expanded to serve breakfasts, but he always made a bowl of curry for himself at lunchtime, just as his mother had taught him in Pakistan. Once the customers smelled Mohammed’s curry, everybody wanted some, and soon he was doing a roaring lunch trade in curries. Bangladeshi and Pakistani people came at first, but before long doctors and nurses from the Royal London Hospital became regular customers too. “My dad comes in everyday and keeps an eye on us,” revealed Aseem deferentially, with an indulgent smile, because although Mohammed still presides, his sons oversaw the expansion in the nineteen nineties to become the large-scale operation it is today. The particular Punjabi cuisine that is the success of their restaurant, also manifests the cultural essence of the Tayyab family. Celebrating Tayyabs, we celebrate the unified identity of this family and their food, that are one and the same.